That, probably apocryphal, quote from Queen Victoria is pretty much all I remember about her. Well, that and the fact that she authorized the building of a huge monument to her beloved husband and that she had a entire time period in history named after her. That is not a huge amount of information when we are talking about a woman who reigned over a world power for 63 years, 7 months, and 2 days. Then I watched The Young Victoria, a movie which I found intensely irritating. It was full of yearning glances, gorgeous clothes, and little substance. It was so focused on the love story between Victoria and Albert that it glossed over almost everything else and in the process left me with more questions than I had started with. I wanted to know what she was really like, how involved she was with the politics of the day, what went on in her life after her husband died and how a woman who was so in love with her husband went on to be associated with a prudish and straight-laced time period. There is a book for that. There is always a book for that. And there you have my life's motto. The book is Victoria: A Life by A. N. Wilson. It is a huge (600 pages) and detailed account of Queen Victoria's life and reign. It quotes extensively from her letters and was obviously thoroughly researched. The book covers such a huge time period and such an outsize character that it is hard to know where to start when talking about it. The list of things I had never known before I read this book is equal parts fascinating and horrifying. I thought I was reasonably well-educated but, for example, I had no idea that her descendants fill or have filled so many royal positions around the world. She was very astute in marrying her children off. Victoria sounds like a difficult woman who needed to be handled carefully. Here is a quote from a letter Prince Albert wrote to her. You have again lost your self-control quite unnecessarily, I did not say a word which could wound you, and I did not begin the conversation, but you have followed me about and continued it from room to room. There is no need for me to promise to trust you, for it was not a question of trust, but of your fidgety nature, which makes you insist on entering, with feverish eagerness, into details about orders and wishes which, in the case of a Queen, are commands, to whomsoever they may be given. At the same time, she is described as a woman of great charm and friendliness. She basically seems to have been a mass of contradictions. Prince Albert was a very intelligent man who, it is generally agreed, was not properly valued by the people during his lifetime. The prince wanted to buy a permanent site for educational, scientific, and cultural institutions, the land now occupied by the Royal Albert Hall, Imperial College, the Victoria and Albert Museum, the Science Museum, the Natural History Museum, the Royal College of Music and the Royal College of Art: the so-called Albertropolis. It is not a bad legacy for a foreign prince of whom the British majority were so suspicious when he first arrived on their shores, nor for the Exhibition which he championed, and which pessimists had predicted would be a failure. Victoria went through a time during her middle life, after Prince Albert's death, when she retired from public life, behaved somewhat erratically and her ministers, according to Wilson, occasionally feared for her reason. It is during this time period that her servant, John Brown, became such a fixture in her life. Her children deeply resented him and he did not show people the respect they thought they deserved. There is much debate about their exact relationship but Wilson feels there is no way to know for sure what went on between the Queen and Brown. Many letters were destroyed after her death, some of them being described as incriminating. She was a woman of sudden and intense relationships. Brown was not the only one of her servants with whom she developed a close and generally disapproved of friendship. Victoria reigned over a decisive time period in Britain's and the world's history. I was amazed when I read about the different Prime Ministers who served during her rule. There were so many famous names, Palmerston, Disraeli, Gladstone. Victoria saw the expansion of the British empire and the industrial revolution. 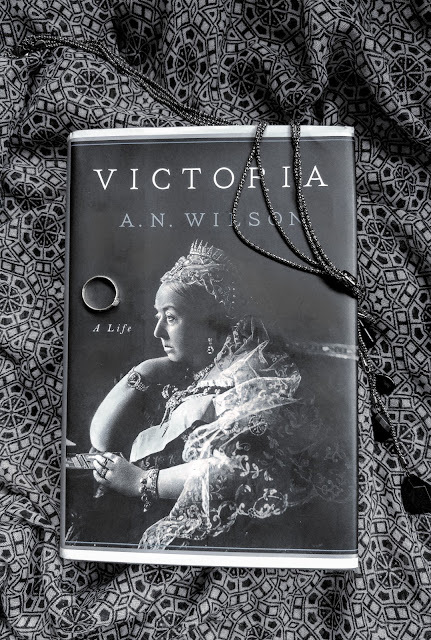 The book does a good job of weaving together Victoria's personal life with the politics, social history, and world events of her day. It is impossible to sum up the life of such a complex woman in just a few paragraphs. Read the book. It is fascinating and makes the history of the time period and the woman who reigned over it fascinating. I know that Albert was very miffed at not being allowed to take on the work of a monarch, such as going through the 'boxes' - and in fact he did end up doing it, something that I'm sure Elizabeth has never allowed Philip to do. Also everything that I have ever seen that was a souvenir of The Great Exhibition (a lot as my husband is interested in international exhibitions) was made in Germany. So it seems to me that Albert's whole idea was to give a lot of work to his own country - and he did! I think he was very manipulative, from what I've read. That is another thing I found very interesting. I did not realize that Queen Victoria was three-quarters German and that there was a huge German influence at that time. In one of her letters she wrote "I miss dear, dear Coburg so much! It was full of all precious recollections--in fact I felt it like the home of my childhood (which you know is swept away in England). I miss the dear German language, all which I feel necessary to my very existence. Do you all cherish it, and do so when I am gone--promise me all of you?" I think they could both be very manipulative when they chose to. I also found the ties between royal houses fascinating. Loyalties must have been so divided at times. Loved this book. I've read lots about Victoria but ANW emphasized the German influence on her life, not just Albert but her whole family background which was a different angle to many other biographies of her. Also loved the affectionate but exasperated tone of the narrative. I listened to this on audio which was great. I had understood that Albert was a German influence but I had not known the complete family background and the extent to which Germany played a part in their everyday lives. Fascinating. Wilson wrote another book, The Victorians, that I just ordered. Have you read that? Yes, I read The Victorians years ago. ANW has also written After the Victorians which is on the tbr shelves. I'll get to it one day!